I finally figured out how to post pictures. 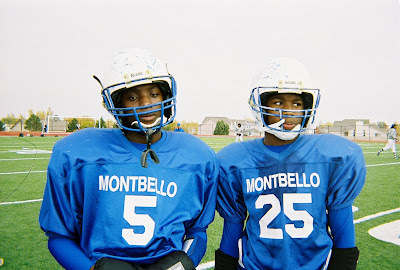 Here are the "Brothers Tough" during the Fall 2007 Football Season. Isaiah is 13, Kadeem is 12. Football players never smile, or at least not when they have their helmets on! Greg Mortenson is a mountain climber, who ended up in a remote and impoverished village in Pakistan, after a failed attempt to climb K2. Moved by the inhabitants' kindness, he promised to return and build a school. Over the past fifteen years, he has built more than 55 schools in remote areas of Pakistan and Afghanistan. "When the porcelain bowls of scalding butter tea steamed in their hands, Haji Ali spoke. "If you want to thrive in Baltistan, you must respect our ways. The first time you share tea with a Balti, you are a stranger. The second time you take tea, you are an honored guest. The third time you share a cup of tea, you become family, and for our family, we are prepared to do anything, even die. Dr. Greg, you must make time to share three cups of tea. We may be uneducated. But we are not stupid. We have lived and survived here for a long time." Mortenson continues, "That day, Haji Ali taught me the most important lesson I have learned in my life. We Americans think you have to accomplish everything quickly. We're the country of thirty-minute power lunches and two-minute football drills…Haji Ali taught me to slow down and make building relationships as important as building projects. He taught me that I had more to learn from the people I work with than I could ever hope to teach them" (p. 150).